If you do not consume enough protein, your efforts in the gym may be for nothing. During a workout you create tiny tears in your muscle fibers and protein is needed to repair these tears and increase your muscular strength and size. Individuals who perform regular strength training workouts need to consume more protein than those who are sedentary or those who only perform aerobic exercise. There are two forms of protein available, either protein from whole foods or protein supplements. It is best to get your daily protein from whole foods sources such as lean meats, fish, poultry and eggs. After a workout you want protein to be absorbed as quickly as possible. This is when protein supplements, in the form of powder, are beneficial. There are different types of protein powder, such as whey, soy, egg or casein. Protein is the macronutrient responsible for building muscle. It is essential for muscle recovery and growth. Protein consumption can increase levels of growth hormone, which is responsible for increasing calcium retention and muscle mass -- and inducing protein synthesis. Consuming protein can also increase your metabolism because your body has to work harder to digest it than other macronutrients. 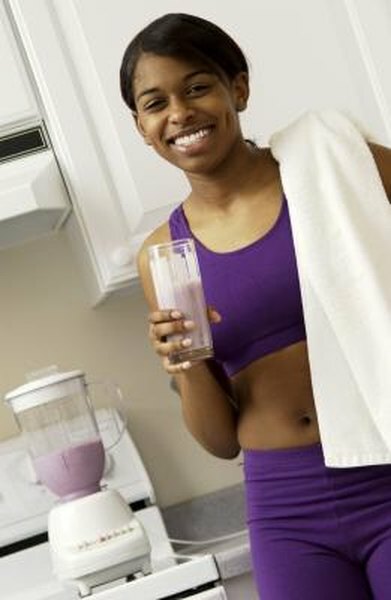 After a workout your body’s protein needs are the highest. During your workout your body has broken down muscle and protein is needed for muscular repair. According to “Nutritional Supplements in Sports and Exercise,” edited by Mike Greenwood, Ph.D., et al., strength trainers need to consume more protein than average individuals. They should take in 1.8 to 2.0 grams per kilogram of body weight each day. For example, a woman who weighs 150 pounds needs approximately 122 to 136 grams of protein per day, about 30 to 40 grams of which should be consumed within 30 to 60 minutes of finishing a workout, according to Greenwood et al. Furthermore, a high-protein meal should be consumed within two hours of completing a tough workout. Consuming a long-term high-protein diet may involve some health risks. For example, a diet high in protein may cause or worsen liver or kidney problems because your body may have trouble continuously eliminating the waste products of protein metabolism. If you are pregnant, have kidney or liver disease or take medication for a chronic health problem you should consult with your physician on the amount of protein that is safe for you to consume. Nutritional Supplements in Sports and Exercise; Mike Greenwood, Ph.D., et al.